It creates heartfelt connections that matter and tells the story of your brand, through your culture, customers and core values. Impassioned businesses work with me to hand-forge their own distinctive brand language, strategic messages, brand narratives and business stories ... ones that meaningfully show their deeper purpose and the legacy their brand is leaving. My writing is not fluffy or long. However, it is very customised. It builds layers of meaning and connection over time and shines its brightest for purpose-driven businesses that want to mean something to their brand's 'right' people. Di is a powerful writer who helped KENNARDS articulate its brand story and brand culture in a single tone-of-voice. She helped us bring to life our values with powerful story telling. The effect has been tremendous across the organisation, with our people now being connected with our brand, and our values. A highly professional writer she has been great to work with and has made the marketing teams' job simple in creating great content for us to use across our marketing channels. My purpose is to help you and your brand own your 'why' and share that deeper purpose and values with your 'right' people – be they inside or outside your business. I'll help you unpack your brand story, voice and purpose, then write persuasive narratives specifically for your brand. How? That's where I fuse the science of marketing with the engagement of stories to make your idea, brand or company memorable to the people that matter most to you. Your brand and purpose will come to life. "...The results were nothing short of jaw-dropping. In our first 7 days of launch in early July, we signed on almost 2000 new customers, using only one image and the words she so effortlessly put together in our social media campaigns – a testament to her undeniable talent. Imagine that: just a couple of sentences can deliver such big results. Amazing." Great brand storytelling doesn't happen in one piece of content. It ebbs and flows with your brand, product, or service and unfolds over time. Think of your brand stories as chapters in a brand narrative book. Each chapter (or content initiative) adds to the overall narrative and deepens the flow of your brand's storyline. "Di worked with our group of companies as a freelance storyteller. Her ability to understand the business and human values of a brand and then package that up into compelling brand narrative is second-to-none. She is a gifted wordsmith that always surprises me with her clever turn of phrase." 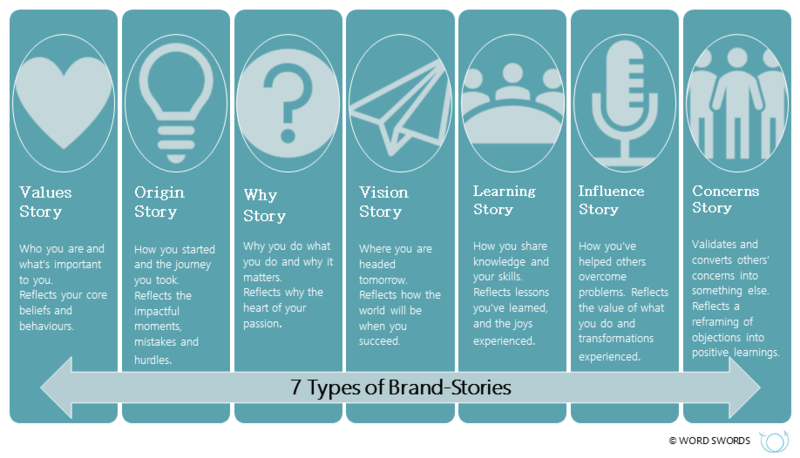 When you create an episodic brand narrative, it cycles through your brand's life stages and customer journeys — becoming an ecosystem of intersecting brand stories. All the customer interactions across the business, the things your people do every day and the company folklore tales — are all potential story sources. "Di was an absolute delight to work with. Fast, efficient, on brief and delivered everything promised ahead of time. Both friendly and professional I would have no reservations recommending Di to any business needing SEO rich, compelling content for either B2B or B2C purposes. The content has been used extensively by our sales and partnerships team to identify and develop leads, provide opportunities to start conversations and as a cornerstone of our maturing LinkedIn business identity." So I understand audiences, branding, strategy and how to layer meaning... without over-complicating things. Brand stories can convey causes, cultivate culture and create converts. Businesses of all sizes from soloists to multinational companies and everything in-between hire me to create, craft and clean-up their brand stories. “We knew what we wanted to say, we just didn’t know how to say it. Di took our garbled ideas and turned them into language which represents exactly who we are." I use a pen for a sword ... to help you win with purpose and passion, not push. If you’re passionate about defining, developing and delivering your brand voice and need a story-based copywriter, brand journalist or brand story specialist, let's work together.